Rather than have the whiteboard statically placed on a wall, you could elect for one that you can move around. The mobile whiteboard is made specifically for this use. Being able to move the whiteboard is extremely convenient as it can be used in any environment. These Double Sided Mobile whiteboards are mounted on a lightweight Aluminium frame with four heavy duty castors. The mobile whiteboard comes with a two sided magnetic finish allowing you to conveniently stick your bits and pieces to both sides of the board. 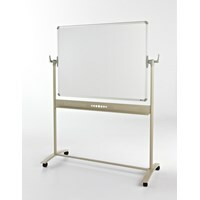 If you’re always on the move in your office/school a mobile whiteboard would be a great alternative to the standard wall mounted edition.